Discussions Magazine Music Blog: Limited 7" EP featuring John Wayne, Dean Martin, Rick Nelson, Johnny Cash, Gene Pitney and Lee Marvin! Limited 7" EP featuring John Wayne, Dean Martin, Rick Nelson, Johnny Cash, Gene Pitney and Lee Marvin! Extremely limited edition seven inch vinyl pressing of this Western movie themed EP in picture sleeve. Four classic Western songs from the golden era of Western movies. A vinyl single in legendary EP-size: 45 RPM, four titles and a picture sleeve! 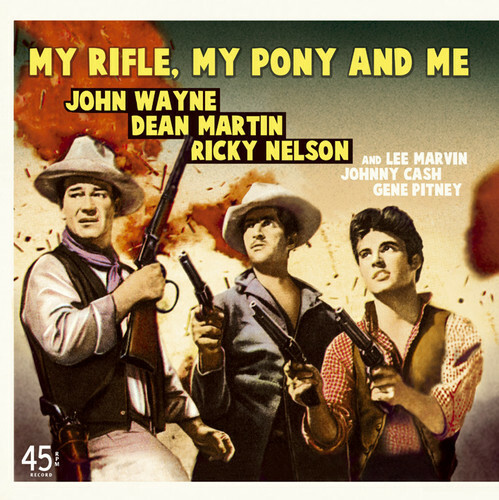 Includes John Wayne, Dean Martin and Ricky Nelson tackling 'My Rifle, My Pony & Me', Gene Pitney's classic 'The Man Who Shot Liberty Valance', Johnny Cash’s vocal version of the ‘Bonanza’-theme and Lee Marvin’s notorious vocal debut on 'Wand’rin’ Star'! Bear Family.